Before you start learning anything, take the following quiz. 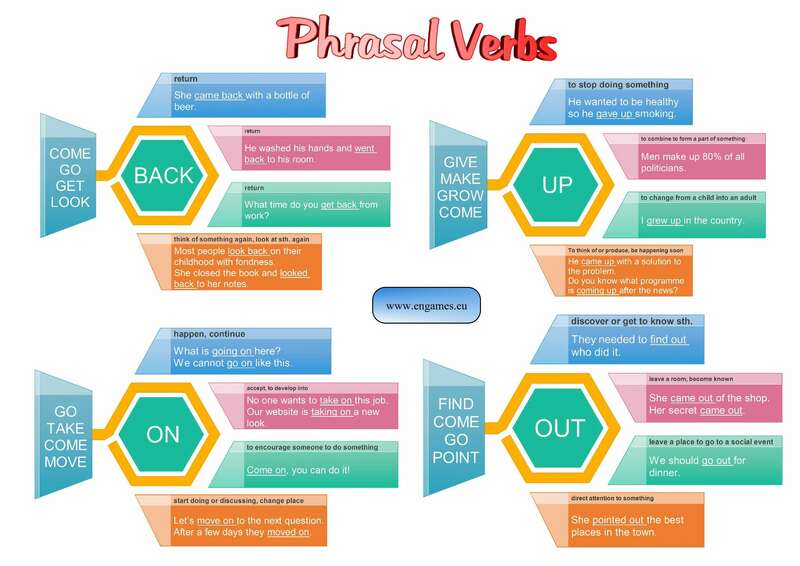 Read the questions and choose the best option to see how many phrasal verbs you already know. If you manage to score 20 points, you can leave this page because you know all the phrasal verbs, I am going to teach here. She went outside and a few minutes later she came ____ with a bottle of wine. When she was pregnant she gave ___ smoking. Why are you so noisy? Can somebody tell me what is going ___ here? He went to the bathroom, washed his hands and went ___ to the living room. He came ___ of the house and went to the bus stop. There was a murder and the police want to find ___ who did it. I want to get divorced. I cannot go ___ like this. I grew __ in a small village. I liked it there. Nobody is willing to take ___ this job. It is not very well paid. Our website is taking ___ a new look. Her secret came ___. Now everyone knows. We came __ with a solution to the problem. Come ___, you can do it!!! Let´s move __ to the next question. Most people look ___ to their childhood with fondness. Women make ___ 25% of the workforce here. I would like to go ___ for dinner tonight. She pointed ___ the most interesting places for us to visit. What time do you usually get ___ from work? After a few days in the hotel they packed and they moved ___. As you are reading these words, you obviously need to learn some phrasal verbs. In this post I would love to teach the following 16 verbs. All of them belong among the 50 most frequent phrasal verbs in English. That means they are really important. The verbs are organised according to the particles. First, read the infographic and then cover the definitions and try to remember the verbs and particles. The first game is called Penalty Shootout. In this game you should choose the correct answer and then try to score a goal. Good luck. To play the game on the full screen click the button below. The second game is in Flash, too, and it will play only on desktop computers. It is called On Target, and your task is to choose the correct option and then shoot all the bad cows and ducks. You can shoot one of the bottles on the wall to get a bonus. Enjoy. If you like this post, please tell your friends and share. Thank you.